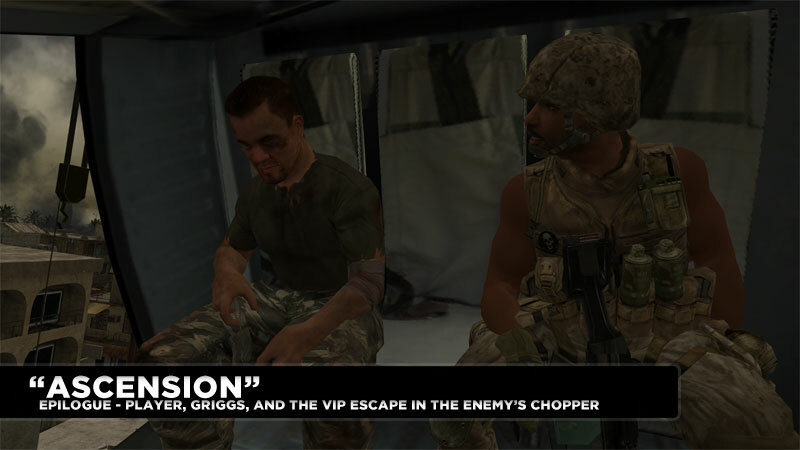 A Russian VIP with valuable intel has been captured by the Mujahideen and taken to Afghanistan to answer for what they view as war crimes he committed during the Soviet-Afghan War. You and your teammates in the U.S.M.C. must rescue the VIP before he is extracted from the city or killed. "Ascension" is approximately seven minutes of non-stop, over-the-top action. You take on the role of Sgt. Paul Jackson with a small squad of U.S. Marines led by Lt. Vasquez and SSgt. Griggs. 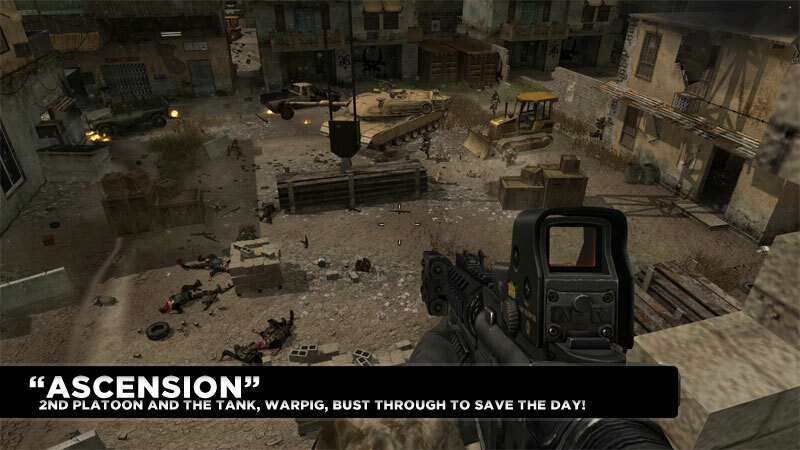 The city is a warzone, and you are running out of time before the enemies extract the VIP. 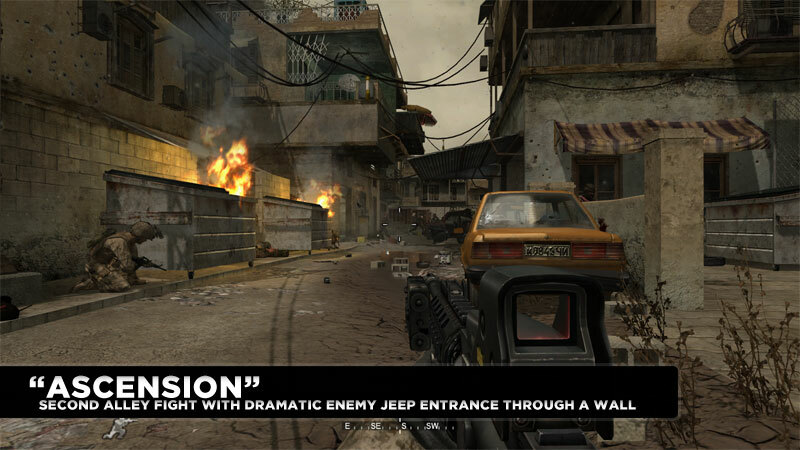 The level starts out with a 'slam zoom' introduction right into a Jeep. 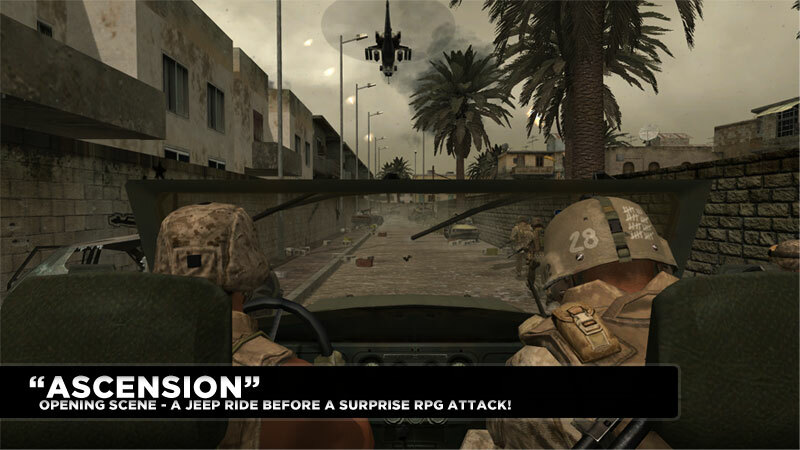 I wanted players to get into the action as quickly as possible to grab their attention, so the narrative is setup over radio communications before a surprise RPG shot causes the Jeep to swerve out of the way. You then fight through a narrow alley into a larger battlefield with a downed and bisected Chinook helicopter as the landmark piece. 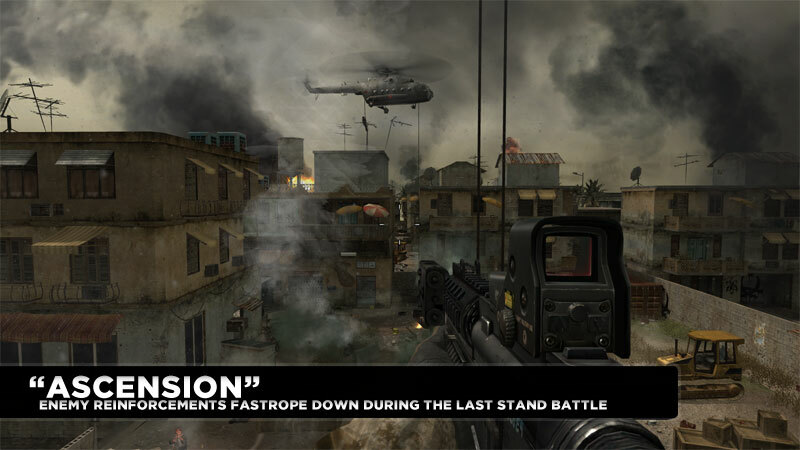 Enemies arrive in a helicopter and fastrope down to reinforce the starting forces. This battlefield also contains destructible vehicles so cover is a temporary luxury as you must jump from cover to cover. This helps create a more intense combat experience. Another alley fight ensues with a dramatic enemy jeep entrance busting through a wall. After this alley, you reach the staging area of a construction site. 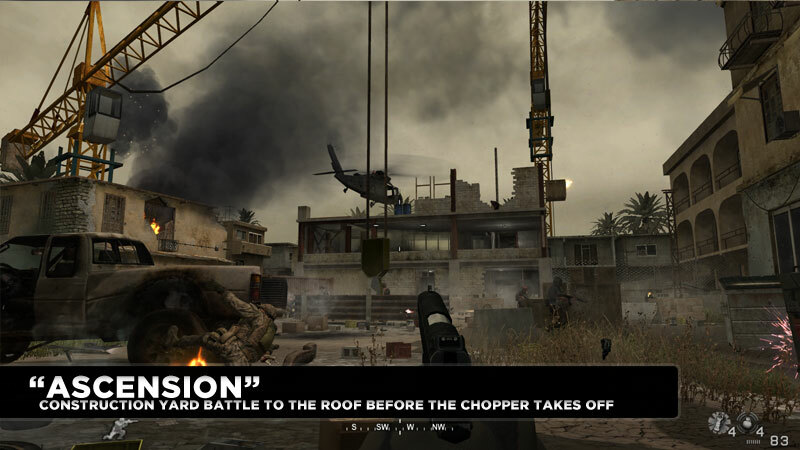 The enemy helicopter arrives and you must fight your way to the half-finished building's roof to stop them from extracting the VIP via that helicopter. 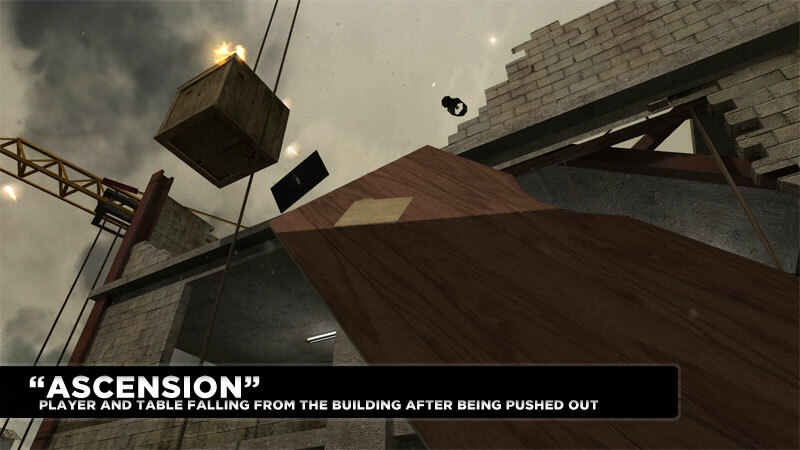 After entering the building and climbing the stairs, an enemy surprises you by pushing you out of the building with a table. Upon waking up from the shock, you discover SSgt. Griggs stabbing the table pusher and telling you to use the rope that will take you to the roof. I specifically lined up this scene so that you cannot miss the box and rope. The box even has fire on it that drops directly to the ground to guide your eyes to where you need to stand. 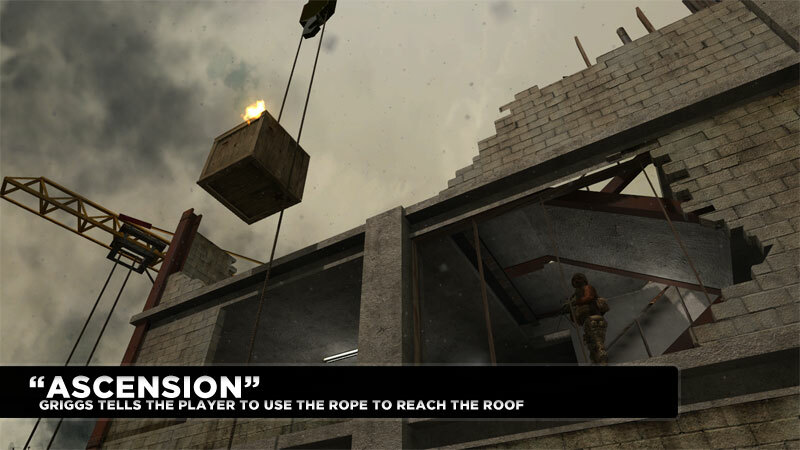 Once you use the rope, you are taken quickly to the roof and enter slow motion time. 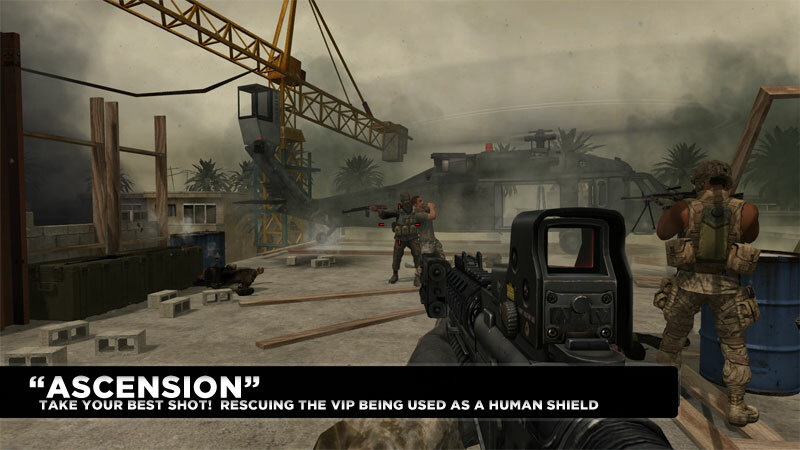 Enemies backstep and turn in surprise while another is using the VIP as a human shield. You shoot them just as SSgt. Griggs and 2ndLt. Roycewicz arrive. Roycewicz readies the helicopter to use to extract the VIP while you and SSgt. Griggs lay down covering fire during the final battle, the last stand. 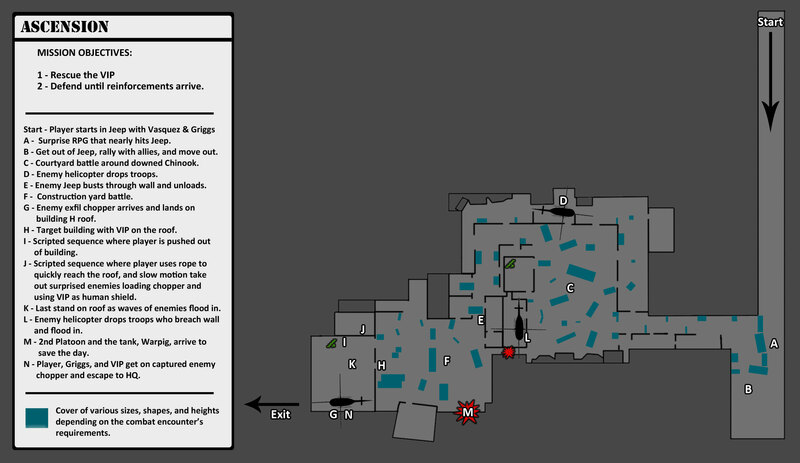 The last stand begins as enemies begin to swarm the building your team now holds. The music and increasingly panicked voiceover, and many enemies armed with RPG's create an intense combat scenario. A wave of enemies arrives via fastrope helicopter and breaches a wall creating a second source of enemies. After nearly losing to the enemy forces, 2nd Platoon's tank, Warpig, blasts through a wall and friendly marines pour in to save the day. With the situation under control, you then board the helicopter with SSgt. Griggs and the VIP to fly to HQ and find out what intel he knows. Create the level concept and story. 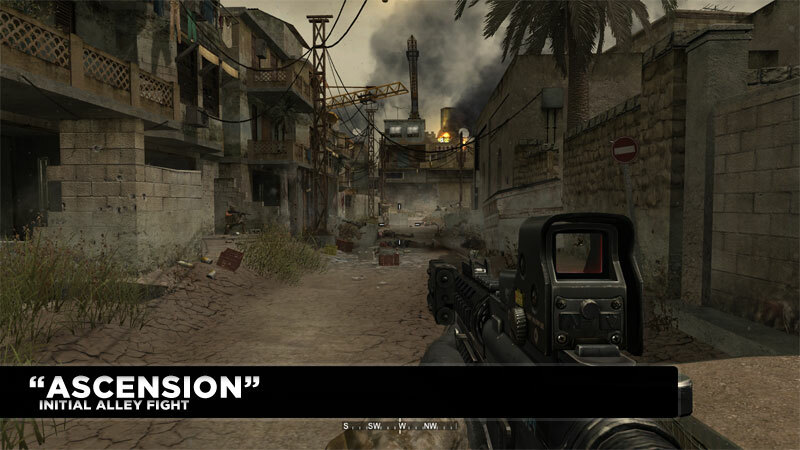 Re-use and modify the multiplayer map "mp_backlot" as the basis for this level. Design and build new BSP level geometry, apply locale appropriate textures, decals, etc. Re-use game models and textures for decoration, cover, etc. 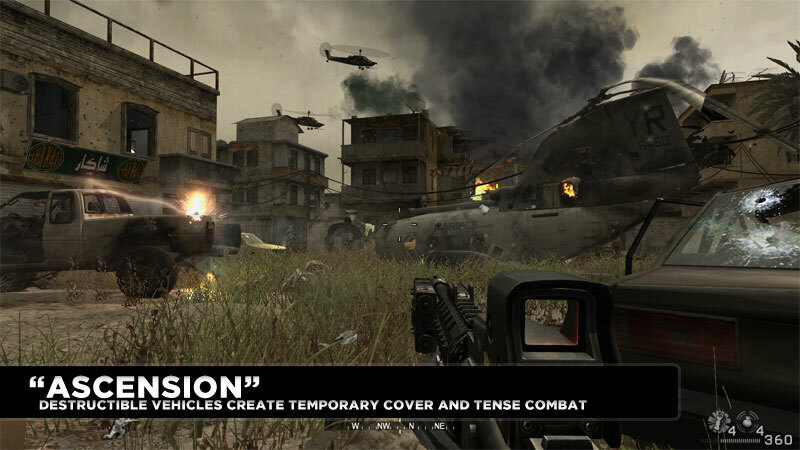 Re-use game special effects such as smoke, electrical sparks, explosions, fire, etc. Choose and trigger appropriate music and ambient sounds to influence player emotion. Place cover in interesting ways to provide micro and macro player choice. Place AI paths, cover nodes, and enemy and friendly spawn points. Balance combat encounters into waves to help the player feel they are slowly pushing back the enemy. Utilize redirection techniques that guide the player to the proper direction through the level. Ensure proper encounter pacing so that there are highs and lows in player interest curve during the level. Write additional dialog to tell the level's story and supplement carefully chosen existing dialog. Record and edit voice-overs for several characters. Integrate dialog text and voice-over recordings into the engine’s localization engine to provide subtitles and voice. Trigger existing and new game dialog to help guide players through the level and build tension. RPG attacking your jeep as the level starts. Being pushed out of the building while SSgt. Griggs stabs the pushing enemy as you wake up. Rope breach sequence where you take a counterweighted rope to the roof and enter slow-mo to rescue the VIP who is being used as a human shield. 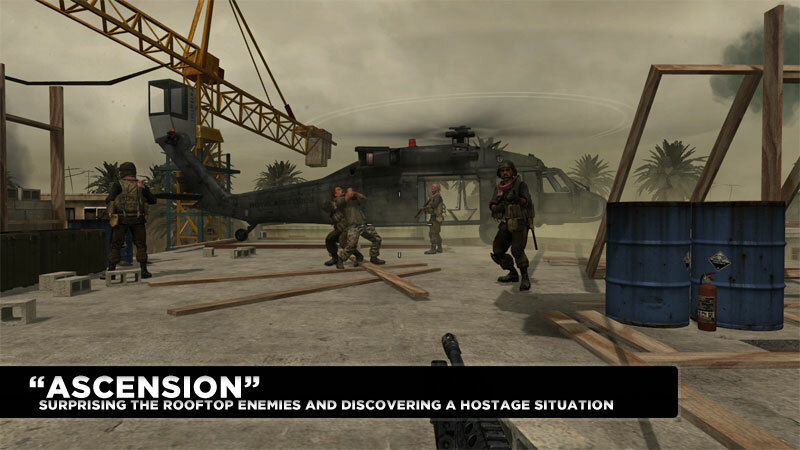 Script the entire level including mission objectives, enemy & friendly movement & spawning, vehicles, explosions, and key dramatic moments such as getting pushed out of a building and the rope breach sequence. Custom effects systems for mortar strikes, sky explosions, etc. to make a true warzone feel come alive. Custom friendly respawn system that moves through the level with you. 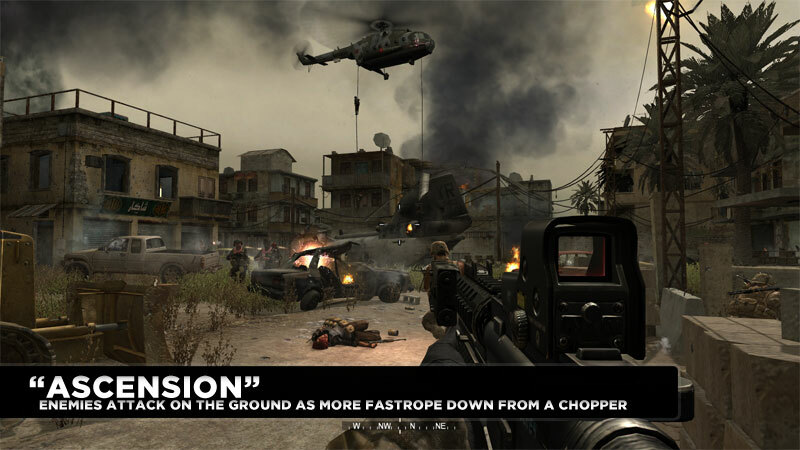 Many re-used and modified features from the CoD4 game itself such as: fastrope helicopter enemies, Griggs knife sequence, human shield sequence, boarding the helicopter with take-off, etc. Conduct playtests with experienced and inexperienced first person shooter players and incorporate feedback to improve the level. 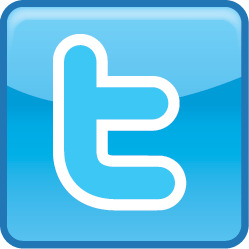 All content and trademarks property of their respective owners.